New apartment buildings in the Brooklyn borough of New York City. People walk by new apartment buildings near the waterfront on April 4, 2013, in the Brooklyn borough of New York City. Apartments make up nearly 40 percent of new homes developers are building today — the highest share in 40 years, according to a new Census Bureau report released Friday. The share of apartments in all new residential construction has increased most dramatically since 2009, with home builders betting that people are more keen on renting apartments than buying stand-alone houses,1 and this shift has major repercussions for the U.S. economy. Apartments’ rise has also created a puzzle for economists: Is the housing market transitioning to a new normal, and are developers responding to a fundamental shift in Americans’ preference to rent apartments — or, rather, does the weak state of the economy have developers shying away from building traditional, stand-alone homes? In addition to new home construction heavily tilting toward apartments, permit requests for future building plans also saw the same pattern — apartments represented 41.9 percent of newly issued permits in April. The number of building permits and the type of those permits — whether for single-family or multi-family homes — are signals of home builders’ expectations of future housing demand.2 And builders are betting that apartments will be a source of growth in the future. The rising share of apartment construction matters because apartments are predominantly built for renters. A separate Census Bureau report, issued quarterly, surveys builders about the “purpose” of new construction — whether the housing is intended to be sold or rented. About 90 percent of apartments are intended as rental units, compared to 25 to 35 percent of stand-alone homes, something that hasn’t changed much over the last few years. But an apartment — or rental — boom may not be good for the economy. According to an August Moody’s Analytics report by Mark Zandi, for every single-family home built, four jobs are created — jobs in construction, or jobs resulting from the homeowner buying furniture or doing house repairs, for example. But for every apartment unit built, slightly more than one job is created. So when people can’t afford or choose not to buy single-family homes and instead rent apartments, the economy gets less of a boost. If you look at the number of single-family homes sold today compared to 2005, before the housing collapse, you might understand why developers are skittish about breaking ground on single-family homes. New home sales, excluding apartments, are down more than 70 percent from their 2005 peak; and existing single-family sales are down about 40 percent. The number of single-family homes changing hands has grown in recent years but remains at historically low levels. Is this trend toward more apartment construction here to stay? Some believe the recent boom reflects a broader change in people’s housing preferences — a desire to live in more urban areas, to “downsize” to a smaller place, or other matters of taste. A long-term decline in the appetite for homeownership could mean a more fundamental shift away from single-family homes. But Jed Kolko, chief economist at the real estate website Trulia, is skeptical that shifting preferences are driving the apartment boom. In a blog post last year, he documented the fact that during the most recent recession and recovery, young adults were increasingly living at home with their parents or with roommates — because they couldn’t afford to live on their own. This could be what’s really holding back the demand for new single-family homes. “It is something between largely and entirely cyclical,” Kolko said in an interview. In other words, if and when the economy — and, in particular, the job market for young adults — improves, people will start moving out and living on their own again in single-family homes. More specifically, the Census Bureau report details structures with five or more units — which are predominantly apartments, but also may be row houses and other structures. Homes with two to four units represent a small share of all new construction (less than 5 percent). So the bulk of home building is either single-family homes or apartments. The volume of building permit requests corresponds nearly perfectly to the next stage of the development process, the start of construction, but with a slight lag. 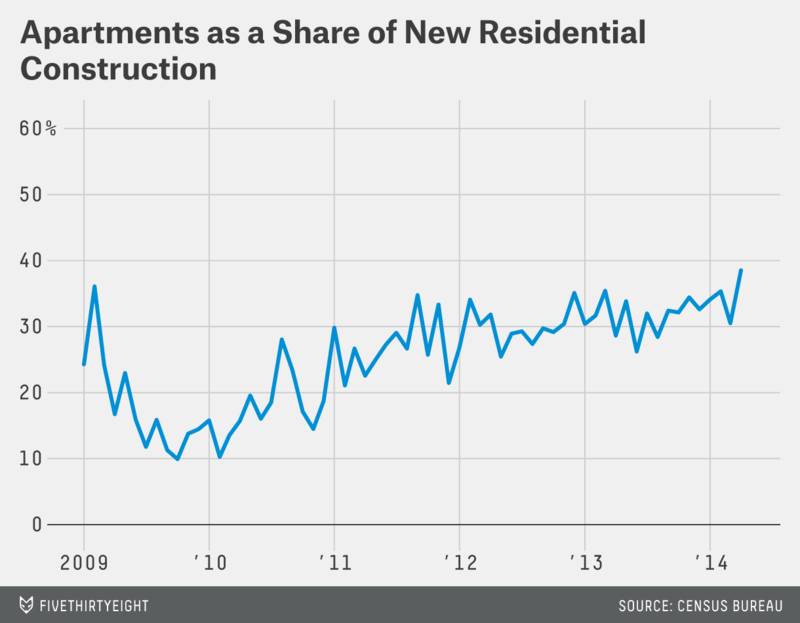 Therefore, as you would expect, newly started home construction, too, has seen apartments take a growing slice of the pie. State-level data at monthly frequencies for permits and construction starts was not released with Friday’s report, and is not compatible with the annual data tabulated here. States like Rhode Island, Alaska and Louisiana are seeing the reverse trend: Developers are building proportionally more single-family homes. 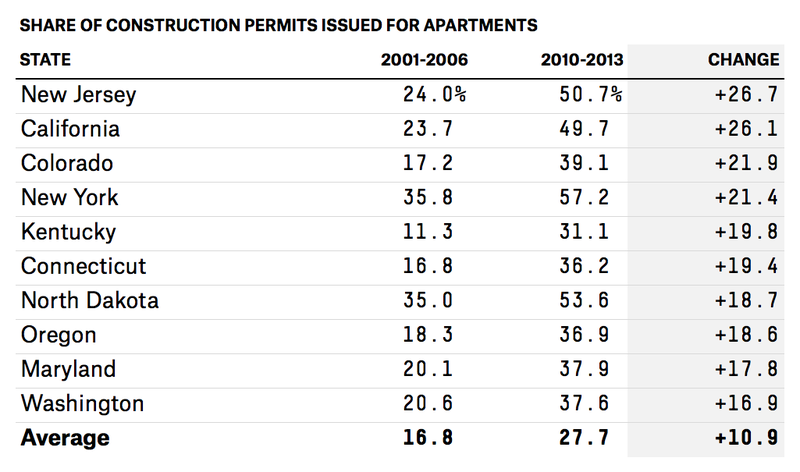 In Rhode Island, apartments only made up 3 percent of all building permits from 2010 to 2013.